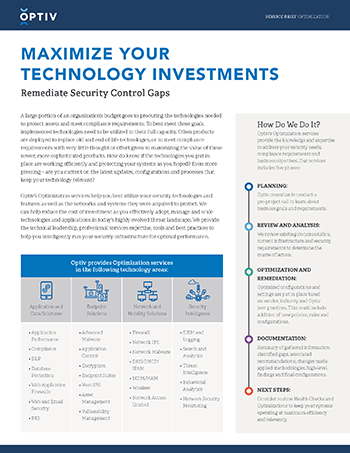 Optiv’s Optimization services help you best utilize your security technologies and features as well as the networks and systems they were acquired to protect. We can help reduce the cost of investment as you effectively adopt, manage and scale technologies and applications in today’s highly evolved threat landscape. We provide the technical leadership, professional services expertise, tools and best practices to help you intelligently run your security infrastructure for optimal performance.